"Homemade backpacking dinner with full flavor! I love making my own backpacking food and this recipe is creamy and full of a perfect Thai peanut flavor. Remember you want to use a noodle that cooks in 5 minutes or less for your backpacking food. Cook time will vary based on elevation." 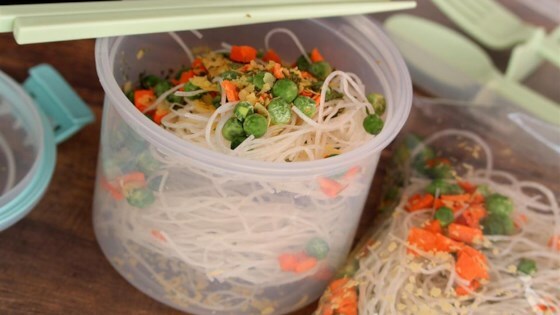 Combine rice noodles, peanuts, vegetables, powdered peanut butter, chicken bouillon, cilantro, chia seeds, salt, garlic powder, ginger, garlic powder, black pepper, and cayenne pepper in a resealable plastic bag. Remove air and seal. Reconstitute rice noodle mixture by pouring in 1 cup boiling water. Mix well and let cook until noodles and vegetables are tender, about 10 minutes. Add 1/4 cup freeze-dried chicken if desired. Substitute cashews for the peanuts if desired. Substitute vegetable bouillon for the chicken bouillon if desired. Substitute flax seeds for the chia seeds if desired. This was delicious, lightweight for trekking and filling.